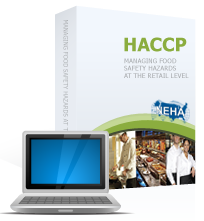 HACCP: Managing Hazards at the Retail Level is an online, self-paced course on the HACCP System and its prerequisites. The course is designed to meet the requirements for HACCP team and staff training and to provide frontline food safety personnel in restaurants and supermarkets and is accredited by the International HACCP Alliance. The course curriculum consists of 14 modules covering topics on important concepts and terminology like prerequisite programs, SOP’s, SSOP’S, Critical Limits, Critical Control Points, preventative maintenance, temperature danger zone in a clear concise fashion that anyone can understand. Special emphasis is placed on the Process HACCP approach. This online course is self-paced. Participants may leave the course at anytime and can resume where they left off. The duration will depend on the individual participant and their prior knowledge of the subject matter. On average, the timeline for completion will be between 45 minutes - 1.5 hours per module. $219.99 (USD), Bulk dicsounts available.